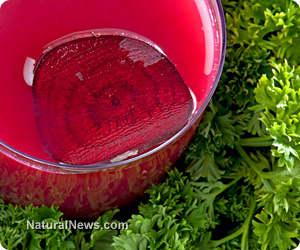 (NaturalNews) Drinking beetroot juice can boost your stamina and athletic performance, scientific studies have confirmed. One of the first such studies, conducted by researchers from the University of Exeter and published in the Journal of Applied Physiology in 2010, looked at seven men who consumed either 500 mL per day of beetroot juice or placebo for six consecutive days. On the last three days, the men's metabolic performance was tested as they underwent both low-intensity and high-intensity step exercises. The researchers found that the muscles of the men who drank beetroot juice needed less ATP to produce the same force, meaning that their bodies needed less oxygen. This allowed those men to perform high-intensity exercise for longer before becoming exhausted, in comparison with men who drank the placebo. In a similar study, beetroot juice was found the reduce the oxygen needed in moderate-intensity cycling by 19 percent, and to increase the amount of time participants could perform high-intensity cycling by 17 percent. Beetroot first attracted the attention of sports researchers because it is naturally high in nitrate (NO3), a compound that the body metabolizes into nitrite (NO2) and nitric oxide. Nitric oxide is known to help regulate muscle contraction, blood flow, the balance of blood sugar and calcium, and cellular energy use. It is also a powerful vasodilator that helps regulate blood pressure and inhibit inflammation. By expanding the blood vessels, nitric oxide increases the efficiency of oxygen in reaching the cells, thereby decreasing the overall amount of oxygen that the body needs. Nitrite has also been shown to help prevent blood vessels from injury and appears to play a role in maintaining a healthy cardiovascular system. To test whether it was really the nitrate content of beetroot juice that was responsible for its stamina-boosting effects, the researchers conducted a follow-up study in which they proved that consumption of beetroot juice more than doubled the blood concentration of nitrates in participants. Other studies have shown that beetroot juice that has had the nitrates artificially removed does not provide the same benefits as natural juice. All these studies; however, suffered from an important flaw: rather than evaluating actual athletic performance, they merely evaluated how long an athlete could perform before becoming exhausted. To compensate for this weakness, researchers performed another study in which participants were timed performing four kilometers and 16.1 km cycling tasks. All participants had rested for 2.75 hours before beginning the test, and had been assigned to consume either 500 mL of beetroot juice or the same amount of a nitrate-depleted beetroot juice placebo. As expected, the researchers found that participants in the beetroot juice group completed the task significantly faster than those in the placebo group (11 seconds faster for the 4 kilometers task 11 seconds faster and 45 seconds faster for the 16.1 km task). While beetroot juice is safe, inorganic nitrates like potassium nitrate can be toxic. Also, high-nitrate diets (including nitrates from beetroot juice) may interact with some pharmaceutical drugs.